1 Preheat oven to 350 degrees F and spray non-stick 12 muffin tin with cooking spray or line with cupcake liners (these are awesome). 2 In a large mixing bowl, add Wet Ingredients and beat with a mixer until smooth. Add Dry Ingredients and process until smooth. Batter should be like for the cake consistency, thicker than for pancakes but thinner than for muffins. Pour batter into prepared muffin tin and bake for 20 minutes, or until tops spring back to the touch or a toothpick inserted in the middle comes out clean. Remove from the oven and let cool completely. 3 While cupcakes are baking, prepare icing by beating Icing ingredients in a medium bowl until smooth. 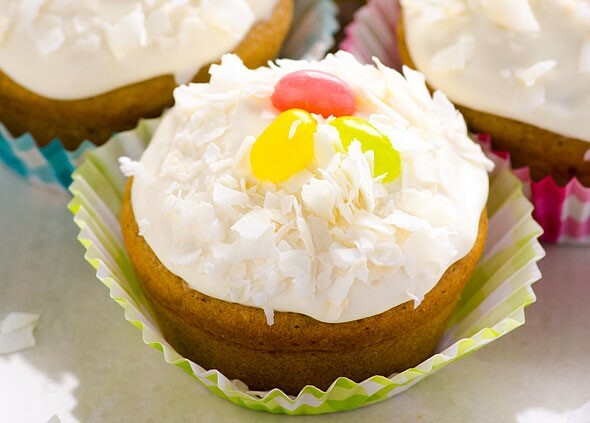 Frost cupcakes, sprinkle with coconut flakes and place a few jelly beans in the middle (decorations are optional).